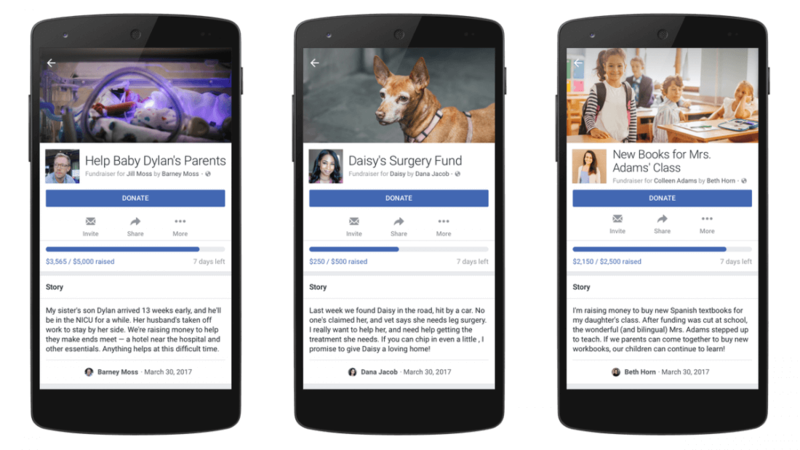 Facebook is rolling out new fundraising tools that will allow anyone to raise money for themselves, a friend or someone or something not on Facebook. The feature expands on its existing tools for non-profits to setup a campaign page, and for individuals to collect funds on behalf of non-profit organizations. Now, by opening fundraising for personal causes the company is taking directly on GoFundMe. Initially it’ll only allow fundraisers to help cover six things: education expenses, medical bills, pets’ medical bills, crisis and disaster relief, personal emergencies, and assistance for families after a death. Facebook requires all fundraisers to go through a 24 hour review process and says it may add new categories in the future, as they learn more and automate more of the review process. The personal fundraisers, currently in beta, are only open to those in the U.S. who are aged 18 or older. Users will be able to set up a dedicated Facebook page with information about the fundraiser, set a donation goal and receive money through the site. Those that you are friends with will be able to see your campaign, make a donation with preset or custom amounts, post a message and make their contribution as public or private as they like — like any other post on Facebook you can set who is able to see this. Even if you are not contributing directly you can easily share the campaign with others. While the idea is not to make money off the tool, Facebook does charge a 6.9% fee plus a standard 30-cent transaction fee to cover payment processing, vetting, and security. In addition to personal fundraisers, Facebook is also starting to let any verified page add donation buttons to their live broadcasts to raise money for approved nonprofits.